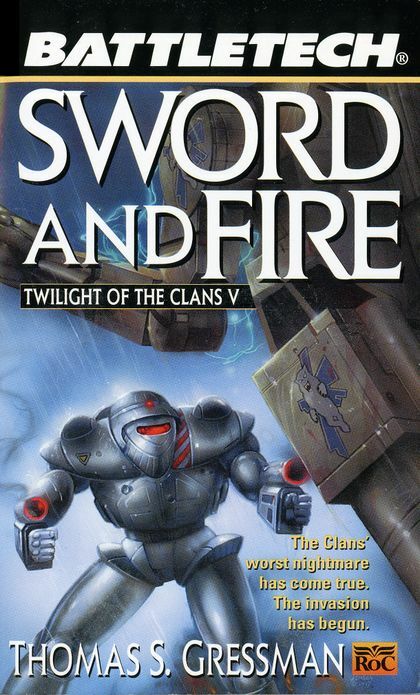 After the rather climactic events of The Hunters, the story of Task Force Serpent and their long range strike against the Smoke Jaguar homeworld of Huntress continues in Battletech: Sword and Fire. And yes, this is when the actual battles really happen versus the maneuvering and intrigue that defined the prior book in this part of the larger story. But to be fair, if the story had just been about the battle for Huntress itself, then it wouldn't have been quite as intriguing. The complications introduced in the third book certain add more flavor to things here and provide additional challenges for the task force. Thus they enter battle with a few things already not in their favor with more threats on the horizon. I had imagined that the battle for the homeworld would be quite the slugfest and I guess in a way I was both surprised and not at all disappointed in terms of how the book met those expectations. Clearly it was never meant to be an easy battle and this particular description of events really reminds everyone that war is not a good thing for anyone. Synopsis: Battletech: Sword and Fire is the fifth novel in the Twilight of the Clans series and was written by Thomas S. Gressman. It covers the events during the invasion of Huntress in the year 3060. The story begins with the new leader of Task Force Serpent, General Ariana Winston of the Eridani Light Horse figuring out how to complete preparations for the actual invasion while also investigating the death of Marshal Morgan Hasek-Davion. With the perpetrator obviously still part of the fleet, it was clear priority to find this person before more damage could be done. Beyond that, the rest of the story naturally takes place on Huntress when the Inner Sphere Forces begin their assault. This is when all their planning comes to a head and when they find out definitively whether or not their forces are sufficient to take on the Smoke Jaguars this deep into their territory and to hold the planet long enough to fulfill their objectives. Waging a war of this nature so far from home and one's supply lines is quite the gamble but the Inner Sphere forces don't really have a choice at this point if they want to achieve their goals and stop the Clans from resuming their invasion. What I Liked: From the moment the campaign for Task Force Serpent was conceived I was pretty keen to find out how the Inner Sphere forces would fare against the Smoke Jaguars on Huntress. Even if they were mostly solahma and garrison units, they were still mostly Clan warriors with extensive experience and that counts for something when it comes to battle. And in the long run the campaign does not disappoint - especially once the Smoke Jaguars formulate a proper response to the initial invasion. And I also appreciate how the invasion is not a single big battle that has no other beats beyond the first wave. Instead it's quite the lengthy conflict as they are trying to take control of a planet and such a battle can't be won quickly. The whole point of the Task Force was to show the Smoke Jaguars and the Clans as a whole that war isn't just some game and it has serious consequences. And this book makes sure to illustrate how bad things can get for everyone involved, not just the Smoke Jaguars. What Could Have Been Better: I was never all that happy with the story had to go out of its way to kill off Marshal Morgan Hasek-Davion and the investigation into his death ended up not feeling all that satisfying as it left us with more questions than answers in the long term. At least the killer was not the obvious suspect, but nor was there any hint of foreshadowing as to who this person was and thus it didn't play out like a proper mystery. In many ways it feels like they didn't quite know how to paint the story of this book in order to make sense as the setup for the following novel in the series. And it's rarely good with the story of a book is lost to a larger narrative setup that extends beyond the book but doesn't necessarily respect the story it has to tell. TL;DR: Battletech: Sword and Fire is quite the trench battle if you get my drift but it does cover a very key moment in Battletech history. It's a stark reminder that war is terrible for everyone and in that sense stands apart from other Battletech books. Thus it gets a good 3.5 vicious Clan attacks out of a possible 5.